The former party leader stepped down after sexual misconduct allegations. 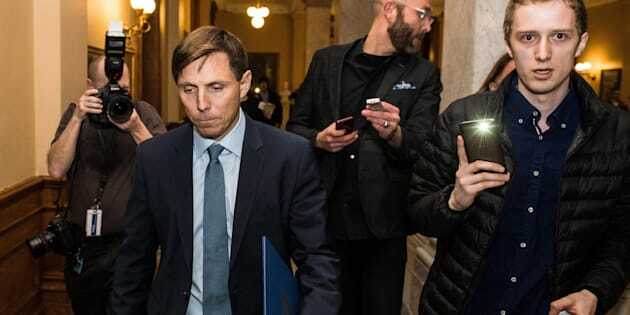 Ontario Progressive Conservative Leader Patrick Brown leaves Queen's Park after a press conference in Toronto on Wednesday, January 24, 2018. Former Ontario Progressive Conservative leader Patrick Brown has been removed from his party's caucus. Vic Fedeli, the interim PC leader, made the announcement in a statement released Friday, hours before Brown made the stunning decision to run again to lead the party. "Shortly after becoming interim leader, I asked Patrick Brown to step aside from the PC Caucus," Fedeli said in the release. "The legislature is set to resume sitting on Tuesday February 20th following Family Day. Earlier today, Mr. Brown was notified that he has been removed from the PC Caucus effective immediately." The release notes the same procedure was used by Brown last year to remove MPP Jack MacLaren. Brown, who serves as MPP for the riding of Simcoe North, resigned as PC leader late last month after two women accused him of sexual misconduct in a CTV News report. Brown has maintained the allegations against him are fabrications and is now saying he will sue CTV News. At the first PC leadership debate hosted by TVO Thursday, Caroline Mulroney said she agreed with rival Christine Elliott that Brown should be allowed to run for the party if he can clear his name. Leadership contender Doug Ford, however, suggested he does not have enough facts yet to make a decision about Brown's future. ​​​​​In interviews with Global News that have aired this week, Brown challenged his accusers to try to press charges against him and suggested political adversaries — including those within his party — were behind his downfall. Though Brown quit as PC leader in the wee hours of Jan. 25, not long after pledging at a press conference to fight the accusations, Brown told Global's Carolyn Jarvis that the resignation letter was sent out without his permission. Brown said he did not want to step down as leader and wanted the chance to meet with the caucus to tell his side of the story. "I never even saw the statement that was sent out," Brown said. "I understood that they were drafting a copy of the resignation. I was shocked when I found out that it was sent out without even an opportunity to see it." The Toronto Star released a one-minute audio recording Friday of what it reports came from one of two conference calls Brown had with PC MPPs on the night the CTV story broke. In the recording, Brown can be heard saying that while he feels the story is "character assassination," he does not want to be an obstacle to defeating the Liberal government of Kathleen Wynne in the June provincial election. Brown is heard saying that he asked his then director of communications Rebecca Thompson to "prepare a statement that I will resign."